We thought we had our best selection ever of flat wedding shoes in 2016, however 2017 is even better! 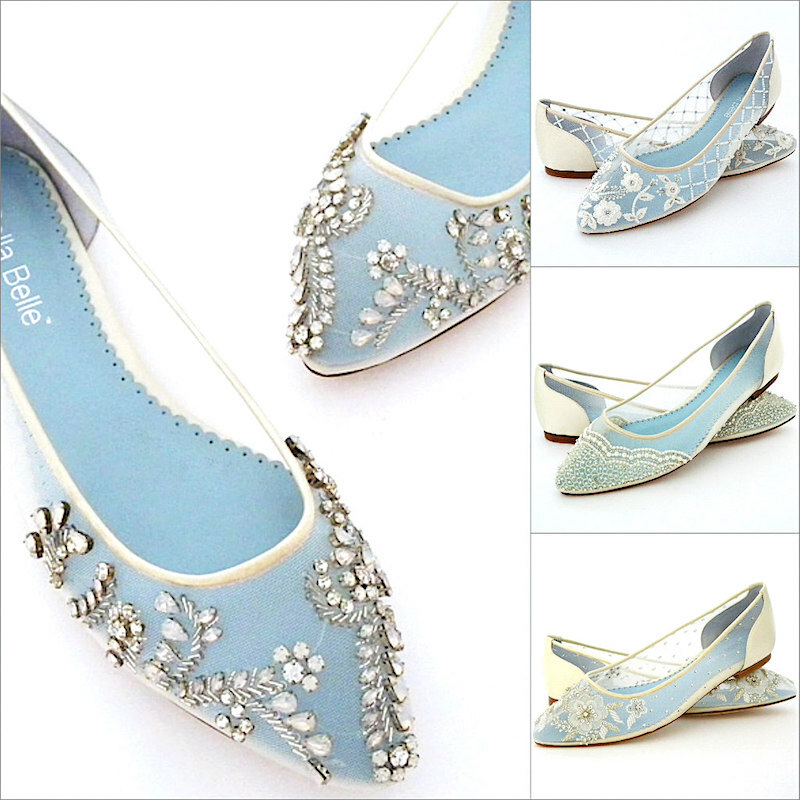 Bella Belle introduced beautiful flats last year, and for 2017 they have outdone themselves with 3 romantic bridal flats that are truly a mid-summer nights dream. Badgley Mischka continues to bring pure glamour to wedding shoes and brings their same fabulous sense of style to flat and low heel bridal shoes. Those elusive flat bridal shoes are no longer. Your search ends here. Whether your searching for lace, sparking crystals, classic to vintage styles, you’ll discover an assortment of flats and low heels at Perfect Details that might just be what your heart desires. Light and airy. Flirty and romantic. 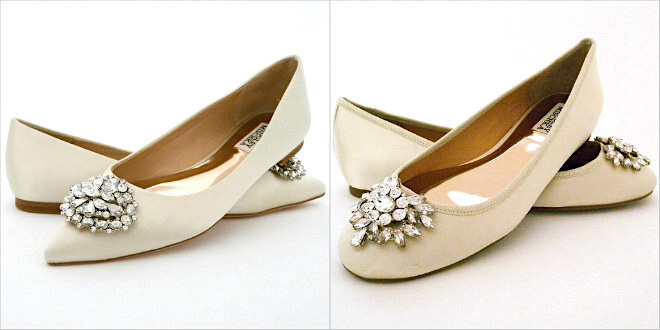 Four of the loveliest bridal flats we have ever seen. Crystal bead work, elegant embroidery and fabulous pearls. All designed by Bella Belle. Meet Gi-Gi our most desired flat from Badgley Mischka on the left and a low heel interpretation of this stunning style Ginny, on the right. This gorgeous crystal pattern is also offered in 2 high heel styles in case you are thinking of wearing heels and then changing into flats. Pointed toe or rounded? 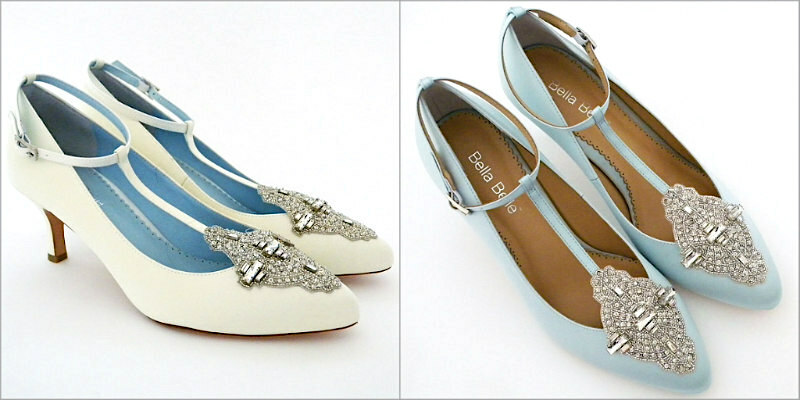 The classic ballet flat with a crystal ornament offered both ways by Badgley Mischka. On the left is Davis on the right is Bianca. Perhaps you don’t want to go totally flat or your gown requires a little bit of heel. You’ll find more 2-3″ heels in 2017 than in previous years, but without “frumpy” styling. Here are some favorites from Bella Belle and Badgly Mischka. Annalise by Bella Belle offers a reasonable 2 1/2″ heel with vintage styling and stunning beadwork at the toe. Completed with an adjustable ankle strap, these darlings are available in both ivory and light tiffany blue. Two styles from Badgley Mischka, Nakita and Petrina offer classic evening shoe styling on a 2″ heel along with stunning crystal ornaments. Both these styles are available in silk white and ivory and can be dyed any color. 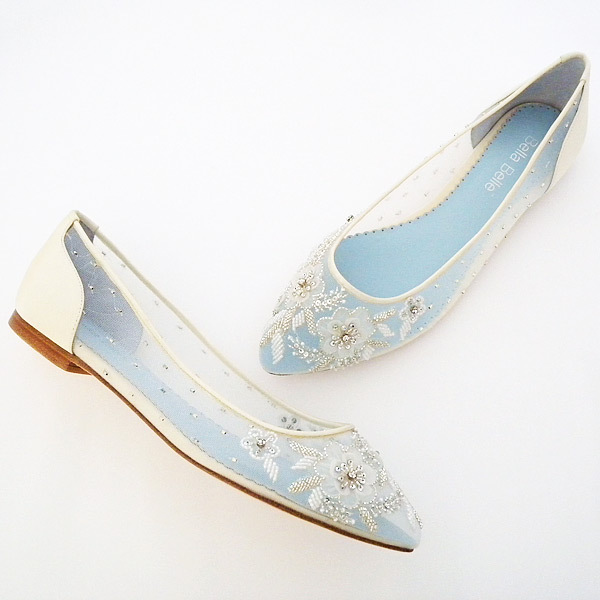 Our #1 flat bridal shoes Adora, by Bella Belle will be continued. A Delicately embroidered and beaded style that just couldn’t be prettier. Arriving late January 2017 this adorable Jelly from Badgley Mischka. Perfect for Beach Weddings! A little tip: Shop for flats in the Spring & Summer. 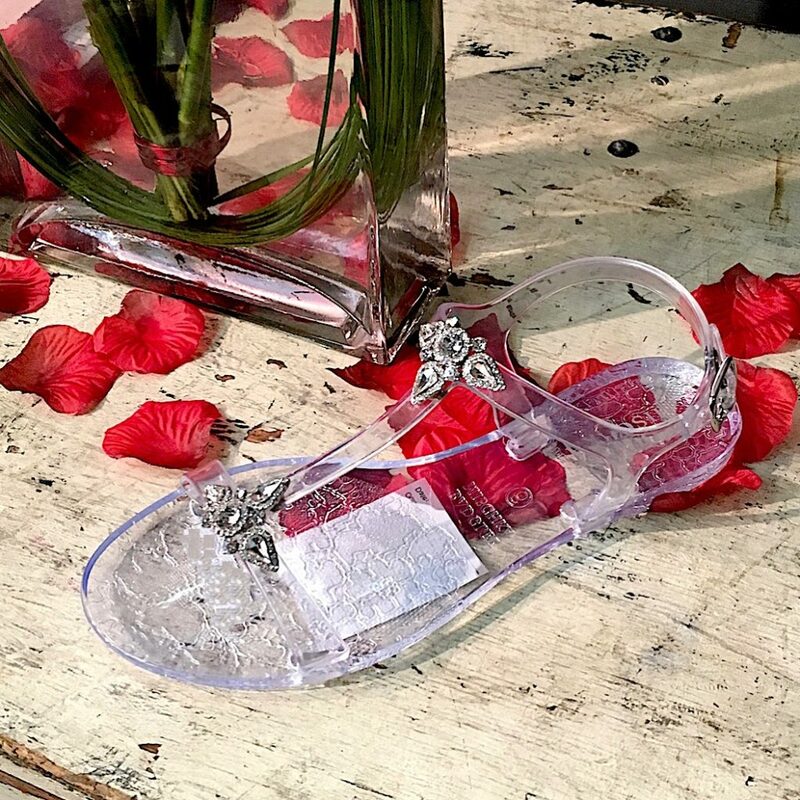 You might just find a soft pastel or ornamented flat sandal among the styles from one of your favorite shoe designers that could be perfect for your wedding. 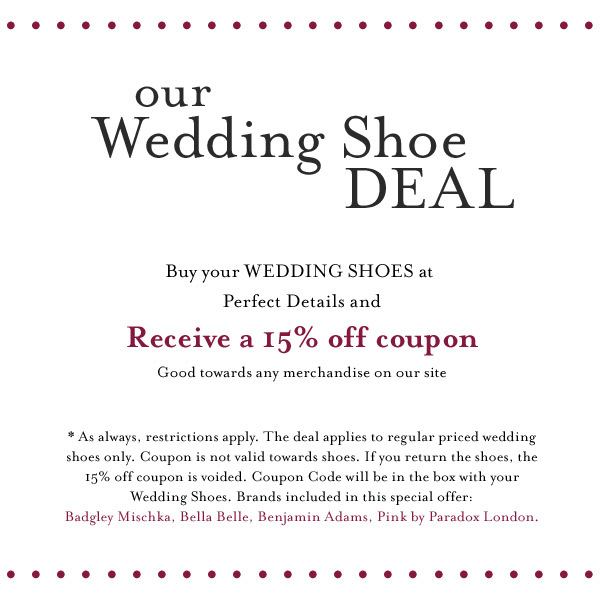 And don’t forget: When you buy your wedding shoes from Perfect Details you’ll receive a coupon code for 15% off anything on our site *excluding shoes. Perfect Details offers the best selection in designer bridal jewelry & accessories as well as evening jewelry & and day to night baubles. Visit our online boutique or stop by our Burlingame, CA showroom. Blue Wedding Shoes? Yes, Please. 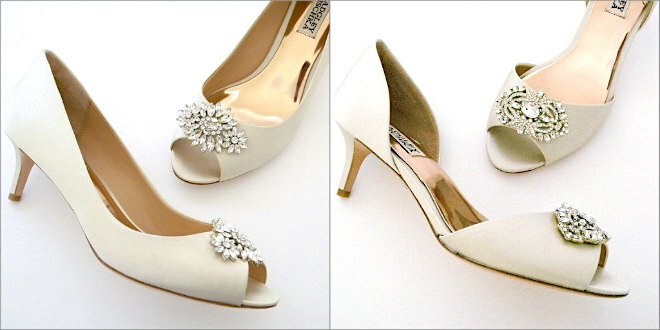 Bridal Shoes! Our 2017 Designer Collections are Here!